"In a violent, futuristic city where the police have the authority to act as judge, jury and executioner, a cop teams with a trainee to take down a gang that deals the reality-altering drug, SLO-MO." Since Sunday is the most boring day of the week, I have decided to move my irregular "Sci-Fi Saturday" feature to the day which complements it the best. Sci-fi bores me to tears and "Dredd 3D" was no exception. The thing is, although I was a regular reader of the 2000 A.D. comic right from the first issue with the free "Space Spinner", I was never a fan of Judge Dredd. When he appeared in the second issue, I didn't really understand what the story was about or care much for the character. I always preferred "Tharg's Future Shocks" and "Flesh" so I always skipped the messy artwork of the three or four "Judge Dredd" pages to get to the good stuff. It wasn't until Forbidden Planet started selling the Dredd stories as graphic novels in the early '80s that I started to get into them and then it was only for "The Cursed Earth" and "Judge Caligula". I always wanted the "Judge Death" editions, but I'd grown out of it all by the time they appeared. Back in the day, everyone expected that there would be a Judge Dredd film starring Clint Eastwood, but of course, it never happened. When the 1995 movie came out starring Sylvester Stallone, I wasn't too impressed as I already had an idea in my mind about how Judge Dredd should be and, quite frankly, Stallone wasn't it. A helmet without a chin strap is just a hat. 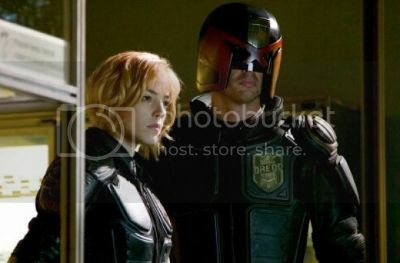 The new Dredd, played by Karl Urban, doesn't really improve things all that much. He is too robotic in a lot of ways and even delivers a line like Robocop at one point, "You have 20 seconds to comply!" In fact, I think Stallone had more charisma and was a lot more entertaining in the role. Like I said, I never really liked Judge Dredd in the comics anyway, so maybe I just didn't get it and the performance was spot on. I'm willing to be wrong about this as it's been nearly 30 years since I last read any kind of comic, 2000 A.D. or otherwise. 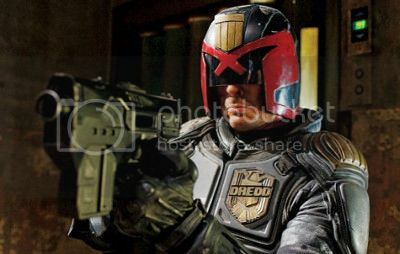 One thing which I really hated was the look of the new Dredd who could have just been any cop in body armour and a badly-designed motorcycle helmet. I'd guess that the director, Pete Travis, was trying to copy Christopher Nolan's "Batman" films to some extent by making things look more realistic rather than comicbook-like. Even with $50,000,000, "Dredd 3D" still didn't have a big enough budget to be larger than life so I can see why it was done the way it was. Some of that approach works and some of it doesn't, but I'll say more about that later. Aren't you a little short for a Judge? Teaming Dredd up with a rookie, in the form of Olivia Thirlby as Cassandra Anderson, was a nice idea but a wasted opportunity by not going with the "Judge Death" story which she first appeared in. Dredd could have been partnered with any number of non-psychic female judges and the film would still have the same overall effect. Her specialist powers are used a couple of times, but I really don't think they add anything much. What is far more interesting (in another negative way) is the tower block that nearly all the action takes place in. The megablocks were envisioned as small self-contained cities in their own right due to Mega City One having 800 million inhabitants. The one in this, "Peach Trees", is strangely sparse in the hustle and bustle that I would have expected. 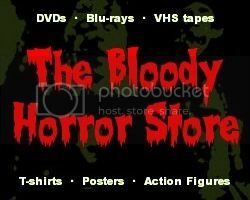 I know the budget probably didn't stretch to it, but it should have been like an out of control mental asylum inside with all kinds of bizarre-looking characters and robots running around. Instead, it's just rather grubby and ordinary. Bang bang bang... bang bang! I won't say that rookie-judge Anderson is grubby-looking or ordinary since she was the only reason why I wanted to watch "Dredd 3D" in the first place. Having seen the trailer and Olivia Thirlby's previous performance in "The Darkest Hour" (2011), I was intrigued by how she would look as a blonde. Call me shallow if you want, but really that's all there was to it. I misjudged (no pun intended) that she had a Sharon Stone quality to her in the trailer which turned out to be non-existent in the film itself. Her comicbook character, incidentally, was based on Debbie Harry from "Blondie". I think she pulled that look off well enough. The action scenes are what this film is supposed to be all about so I need to say something about them. Although the gun battles and explosions are decent enough, I actually got a bit bored around the 45 minute mark and, apart from one very nice head shot, I felt that things didn't really pick up again until the final 10 minutes. There wasn't enough characterisation to keep me all that interested in either Judge Dredd or Anderson, and I started to hope, albeit vainly, that the bad guys would win. 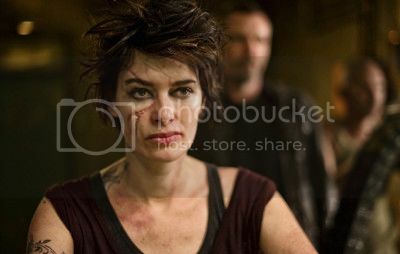 Even though Lena Headey, as Ma-Ma, is made-up to be quite ugly with all her scars and skanky tattoos, I was still more on her side than on the side of the judges. I've never been all that keen on the police anyway nor, in case you wondered, have I ever been into gangs and drug culture, so I was forced to choose the lesser of two evils. It's kind of an annoying trope that the bad guy (or gal) has to be disfigured while the hero (or heroine) had to be all blonde and "apple pie", but that's the way with the movies. Stuff like that is as predictable as disposable black characters, and there are quite a few of those in this film too. The biggest problem with "Dredd 3D" (other than the fact that I didn't actually watch it in 3D) is its predictability. There is never any chance that the title character is ever going to be in any real danger and his blonde, super-powered sidekick isn't exactly likely to be raped, skinned, thrown over a balcony or eaten either, more's the pity. I wish that Mega City One's cannibalism problem had been mentioned, but maybe, if there's ever a sequel, that will be dealt with next time. For a non-horror movie, there are some nicely done gory bits and, due to my problems with vertigo, a few too many aerial shots with people falling from great heights (à la Christopher Nolan) made it a source of future nightmares for me. I had weeks of plummeting to my death just as I started to drift off to sleep thanks to "The Dark Knight Rises" and cheese sandwiches before bedtime. Because "Dredd 3D" doesn't belong to my favourite genre and isn't exactly brilliant as an action movie either, I'm going to rate it as slightly below average. There are some good bits, but it's just another mindless and clichéd cop movie overall. As a reboot (or re-imagining) rather than a sequel to "Judge Dredd" (1995), "Dredd 3D" felt like an expensive pilot for a TV series rather than a theatrical movie to me, and by trying to be too realistic rather than futuristic, it isn't all that memorable.